We pulled into Flagstaff around 6PM. Our first stop was actually to the local Walmart because I left my heavy wool jacket at home! I was in disbelief that I forgot my very important jacket and had to make due wearing multiple layers for the weekend. 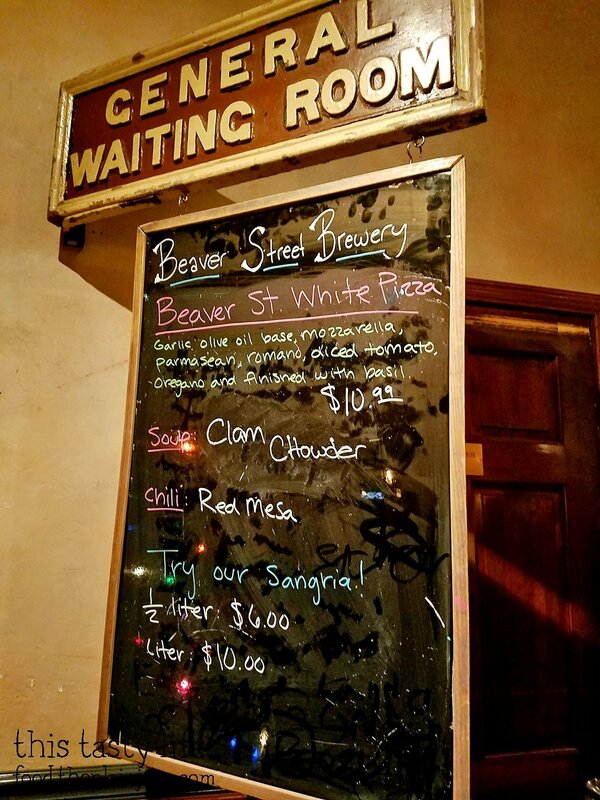 After checking into our hotel nearby, we went off for dinner to a local restaurant called Beaver Street Brewery. This place was hopping on a Friday night! I spied lots of families in the dining room and there were quite a few folks waiting for a table that evening. It took about 25 minutes for us to get a table. 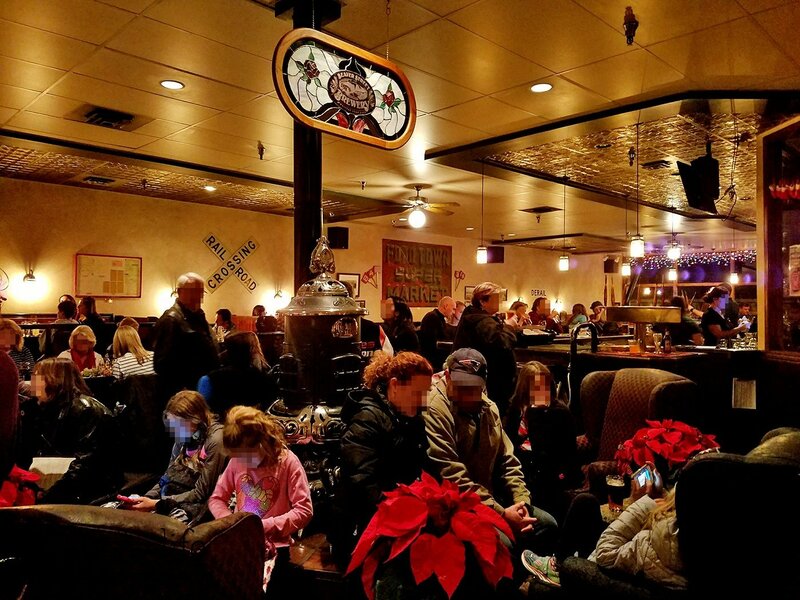 Beaver Street Brewery has a variety of items on their menu – including pizzas and locally made beer. There was a nice homey feel to the place. Some of the walls are decorated with kitchen tools, pots, and pans. There’s also various train items since they are very close to Flagstaff’s Historic Train Depot. Happy to warm and getting ready for food! The boys each got a couple of sodas. 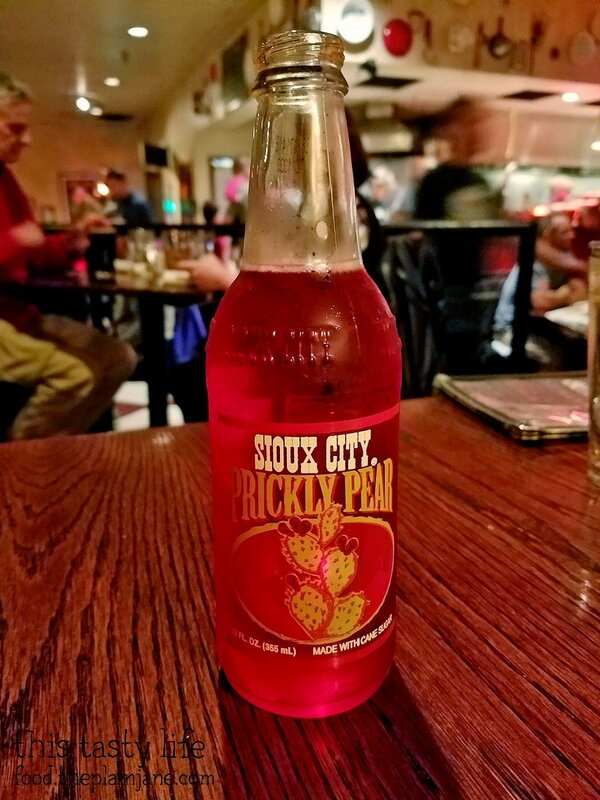 T got this Prickly Pear soda which I thought was god-awful sweet. On another note, in all the gift shops in Arizona they have prickly pear flavored things. Prickly pear taffy. Prickly pear licorice. Prickly pear blah blah blah. 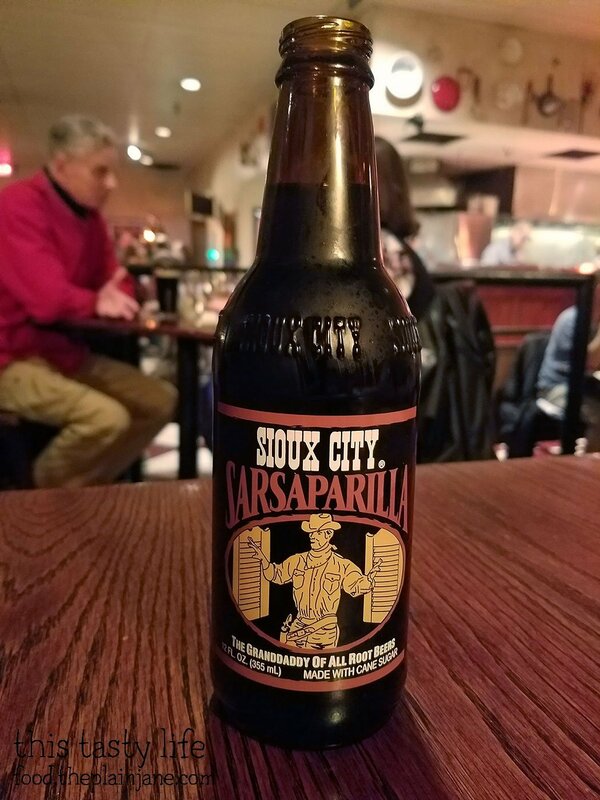 Jake some some Sarsaparilla. I’ve always loved the name of this drink. 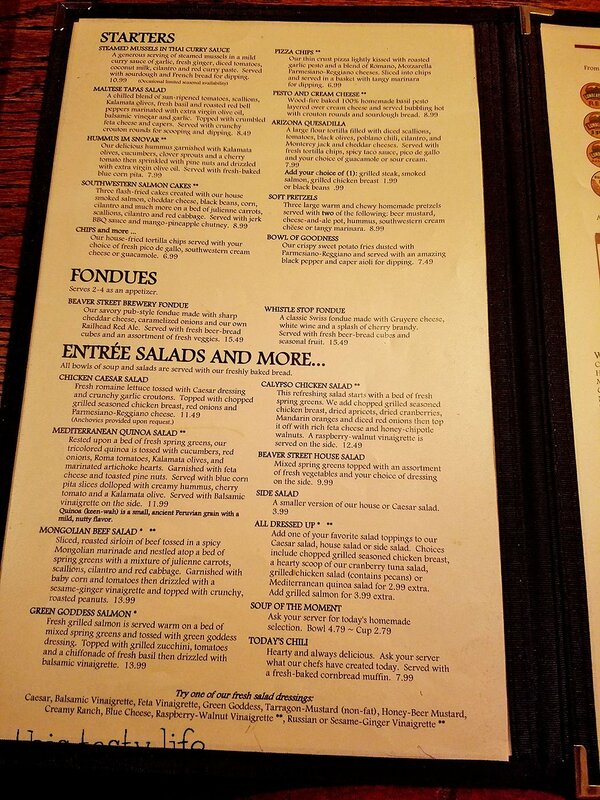 The thing that caught my eye when doing restaurant research for Flagstaff was the fondue at Beaver Street Brewery. That’s what brought me in and that’s one of the dishes that we shared. 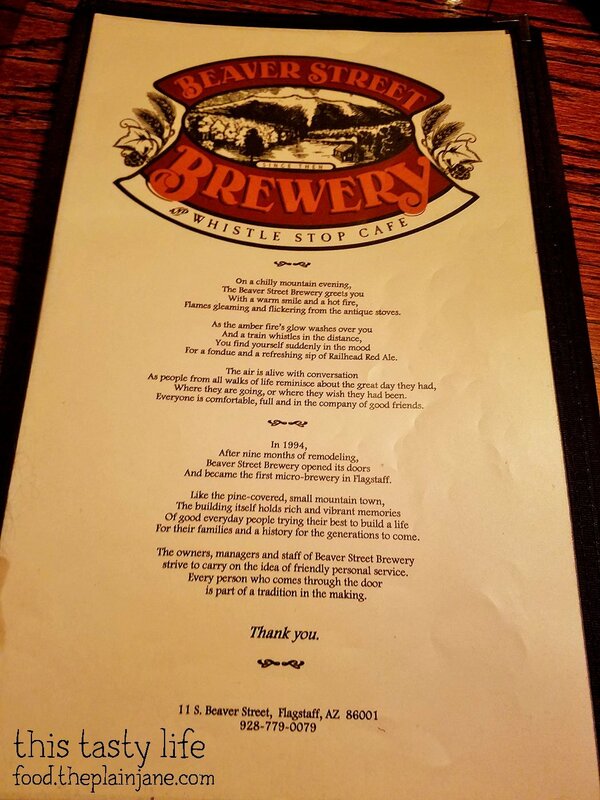 They have two kinds of fondue and we choose the Beaver Street Brewery Fondue [$15.49] which was a pub-style fondue made with sharp cheddar cheese, caramelized onions, and their own Railhead Red Ale. 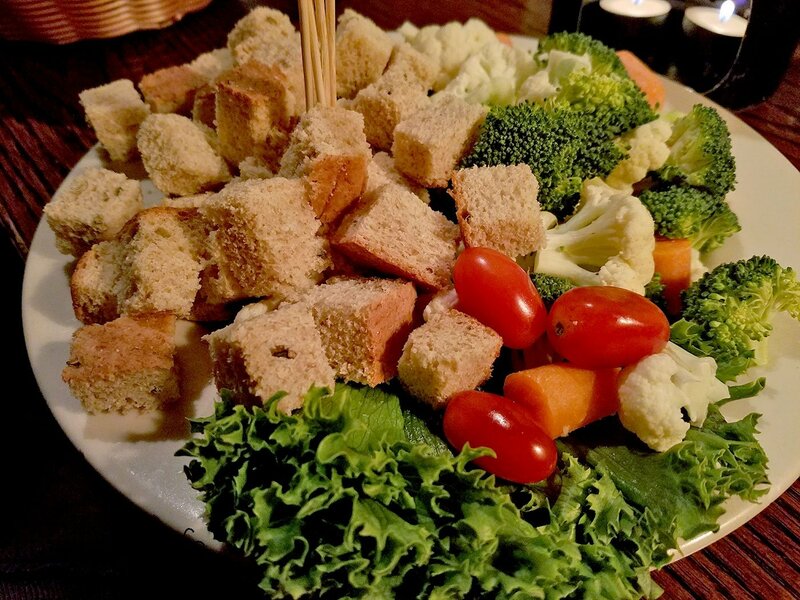 It comes with cubes of bread and veggies. 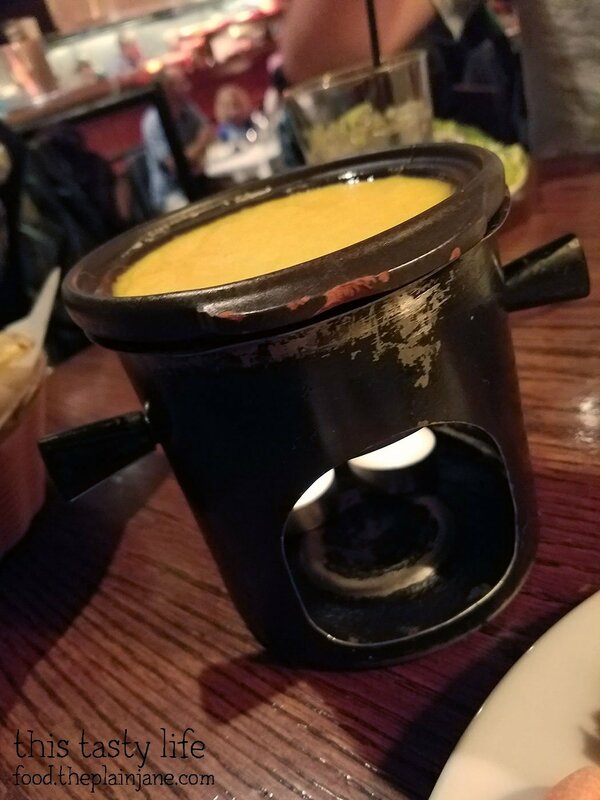 The cheese comes in a cute little pot with two tealight candles underneath to keep it warm. I didn’t notice at first but the bread as caraway seeds in it. UGH. I managed to pick the seeds out and find cubes with no seeds in it to make my experience more enjoyable. Cauliflower also tastes SO MUCH BETTER covered in CHEESE. The cheese was gooey and stringy and DELICIOUS. We loved dipping the food in it! 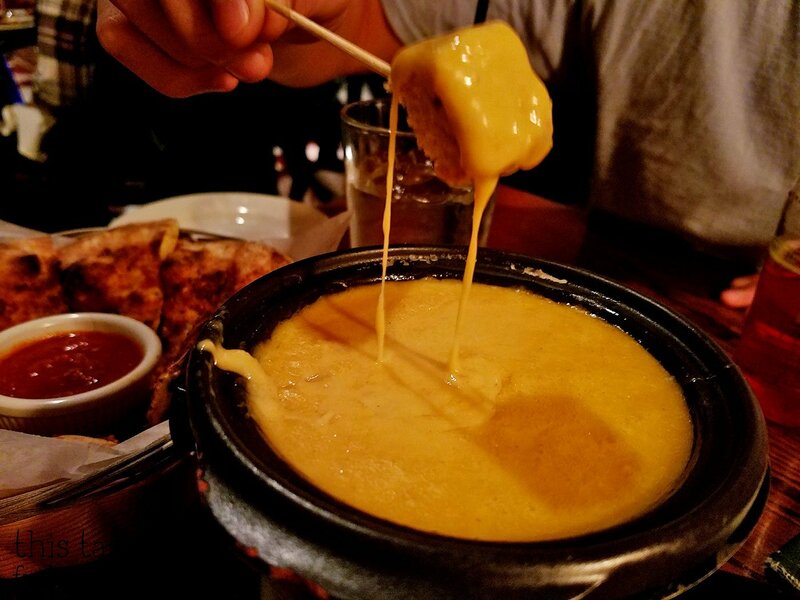 The fondue had a really good flavor and I liked how it stuck well to the food we dipped into it. The fondue was T’s #1 favorite thing on this trip. 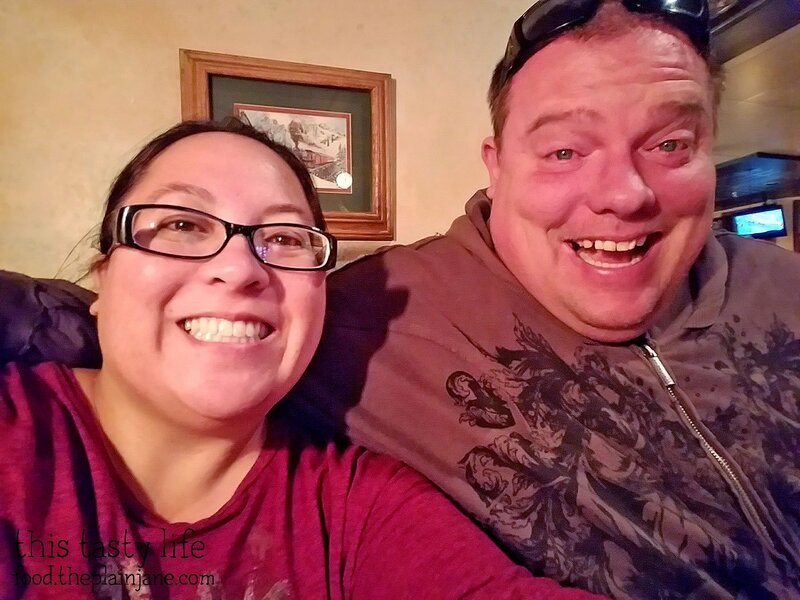 We let him finish off the rest of the fondue and he made sure to get every little bit out. 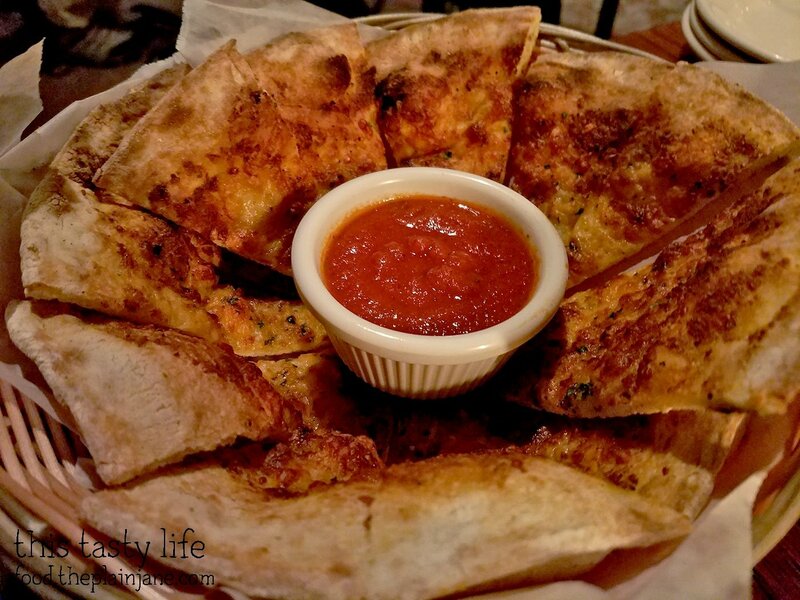 We got another appetizer called Pizza Chips [$6.99] to share. It’s kind of like pizza but with less cheese and sauce on top. They use one of their pizza crusts to make this so it’s got a little bit of cheese and lots of herbs. These were toasty with a little bit of crunch on the edges. The marinara sauce was excellent. 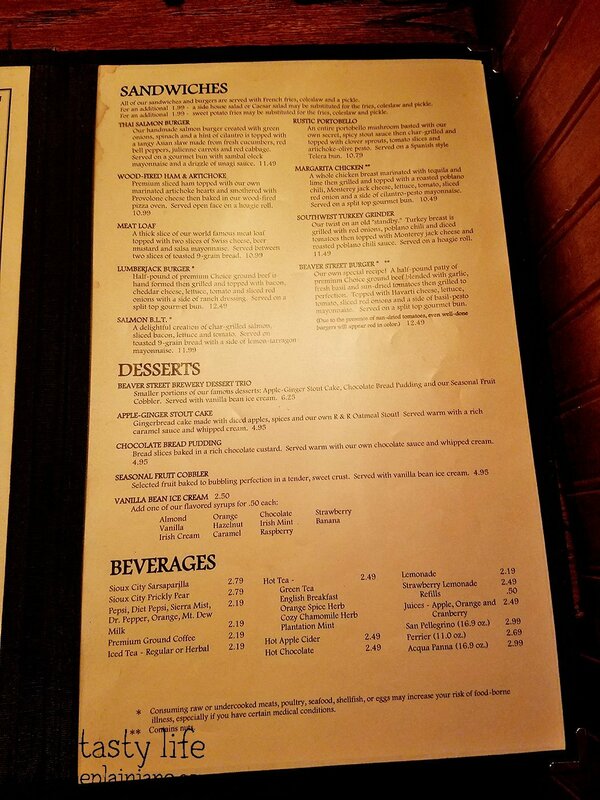 Whenever I see Chicken Fried Chicken [$14.99] on a menu, I always think it says Chicken Fried Steak. 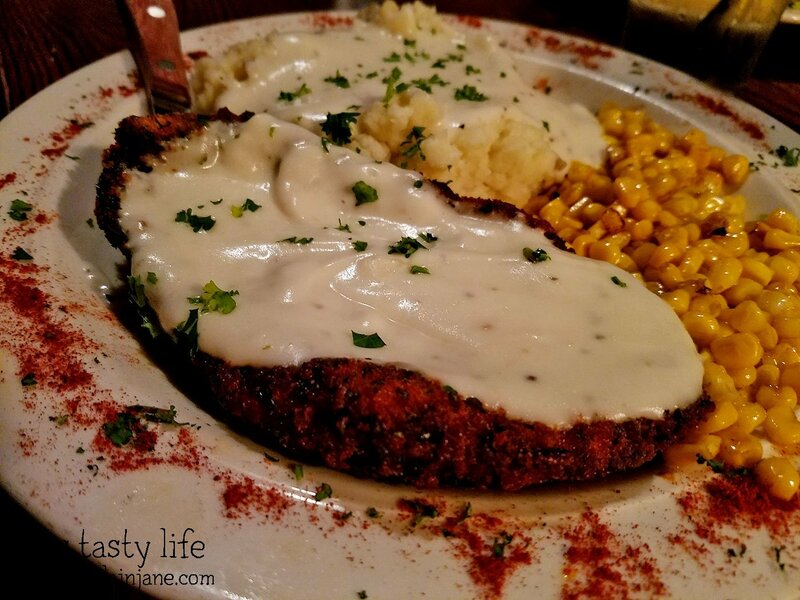 Maybe because secretly I would always rather have chicken fried steak? T decided to pull the trigger and try out the chicken fried CHICKEN which came with mashed potatoes, lots of country gravy, and corn. They use chicken breast which is fried in a crispy coating – just like the steak ones! This one had a decent flavor. 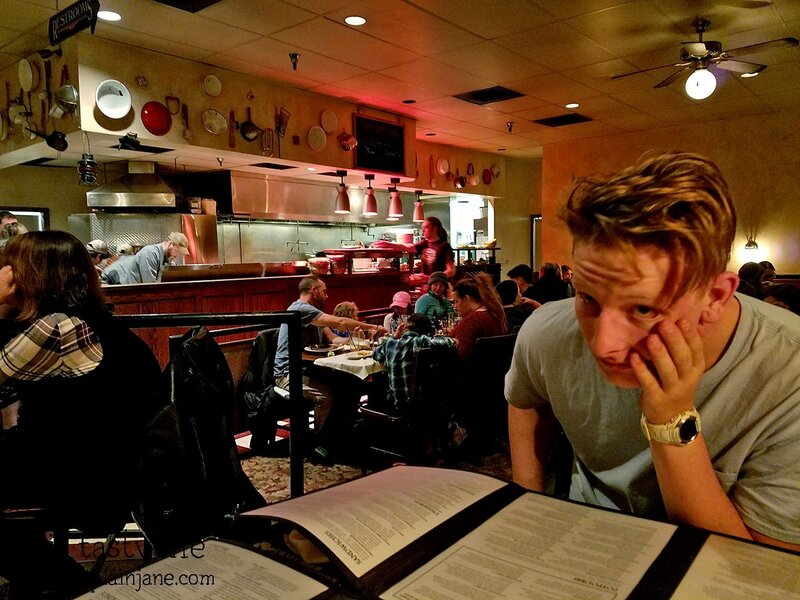 It was a hearty, filling, stick-to-your-bones kind of meal, good for those cold winter nights in Flagstaff. I’d prefer it with dark meat since white meat isn’t totally my thing, but hey – it was a good meal. Jake surprised the hell out of me by suggesting we share the Mongolian Beef Salad [$13.99]. Jake NEVER suggests salads as a meal so I was quite impressed with his suggestion. 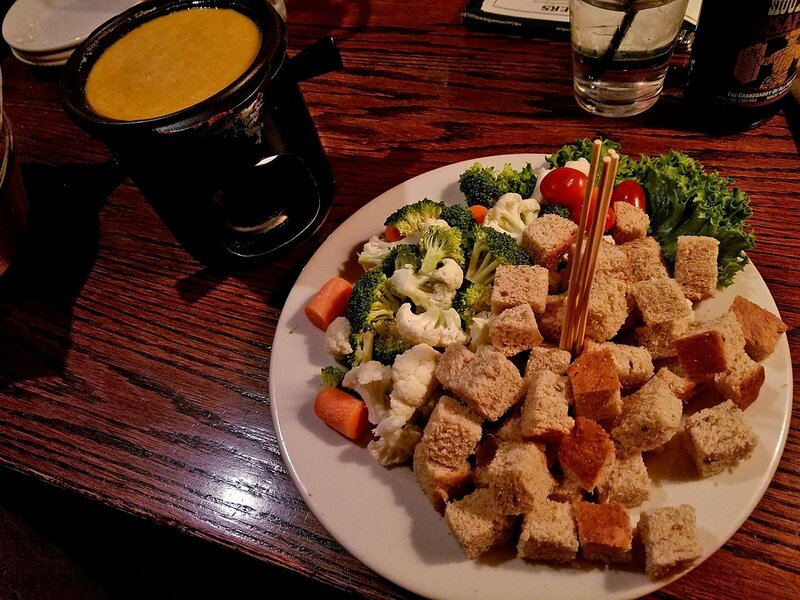 He figured the cheese and bread would all be heavy and having a salad would help balance out our meal – and he was right! 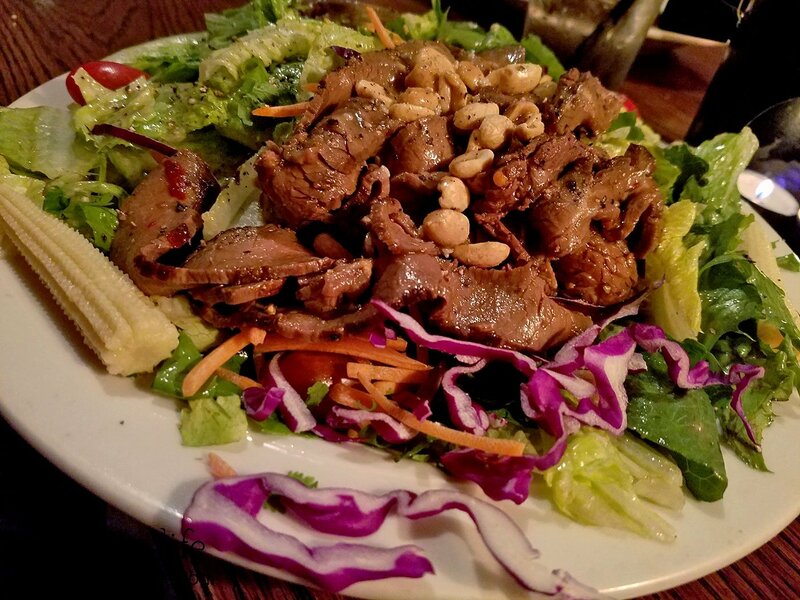 The mongolian beef on the salad was really tasty and had a great Asian-y flavor to it. I loved the peanut sprinkled about and the fresh flavors of the salad. The dressing was also really nice – a little bit sweet. We couldn’t leave without trying dessert and luckily they have a nice little Dessert Trio [$6.25]. This was a great way to sample all of the desserts for a lower price. 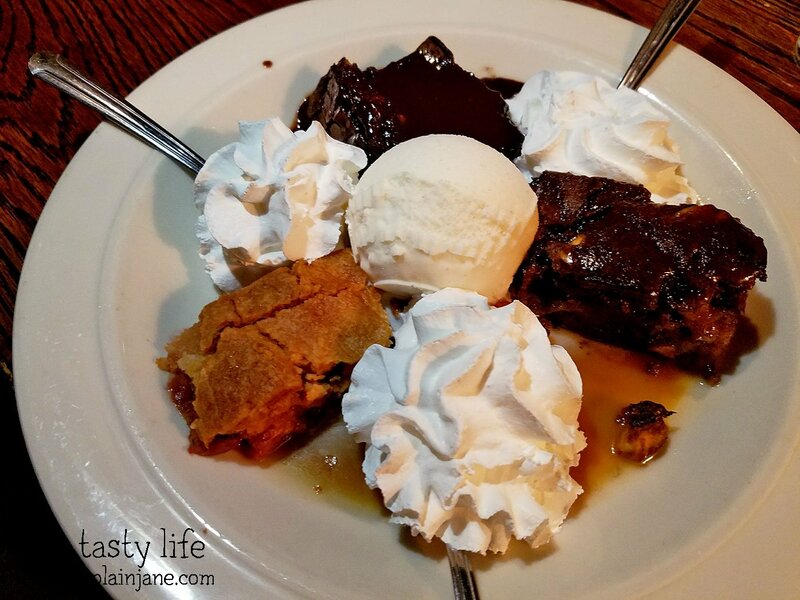 You get one piece of Apple Ginger Stout Cake (on the right), Fruit Cobbler (lower left) and Chocolate Bread Pudding (top). I thought the Apple Ginger Stout Cake was the bread pudding just by the dark looks of it. It had a gingerbread flavor to it so I ended up referring to it as the “gingerbread cake”. It turned out to my my favorite of the bunch due to the flavor and texture of the cake. 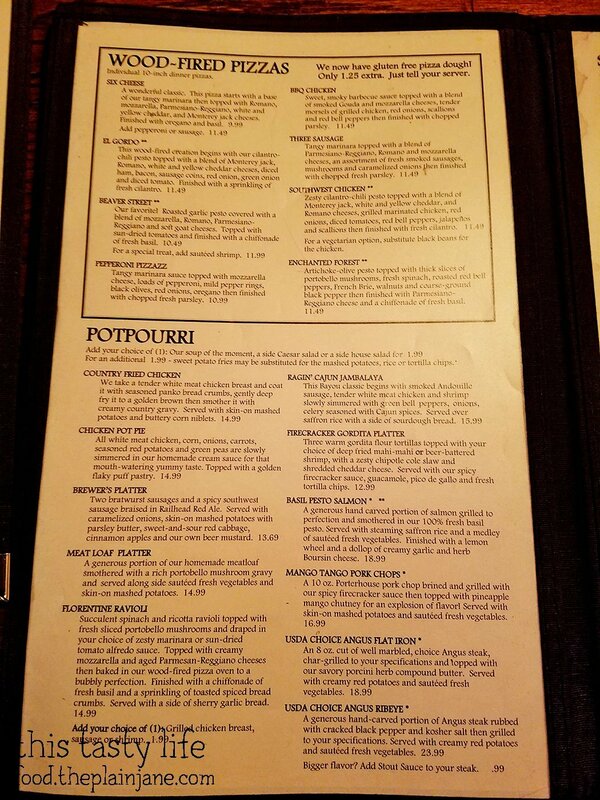 The fruit cobbler was just okay and the chocolate bread pudding was far too rich for my liking. I was glad we got to try out all three though instead of just getting stuck with one choice! Nobody tried the Red Mesa Chili?! You’re going to have to go back, I need a full report on it. Sorry, Frank. I guess we’ll have to go back! ?